Google Map of our Blog Posts: See if we have covered a site near you! Many residents and tourists alike that stroll up and down Connecticut Avenue north of Dupont Circle pay little attention to the architecture above the first floor retail space. However, if one pays close attention to the architecture preserved on the upper floors, it is revealed that the majority of the buildings lining the commercial corridor today were built as large residential mansions. 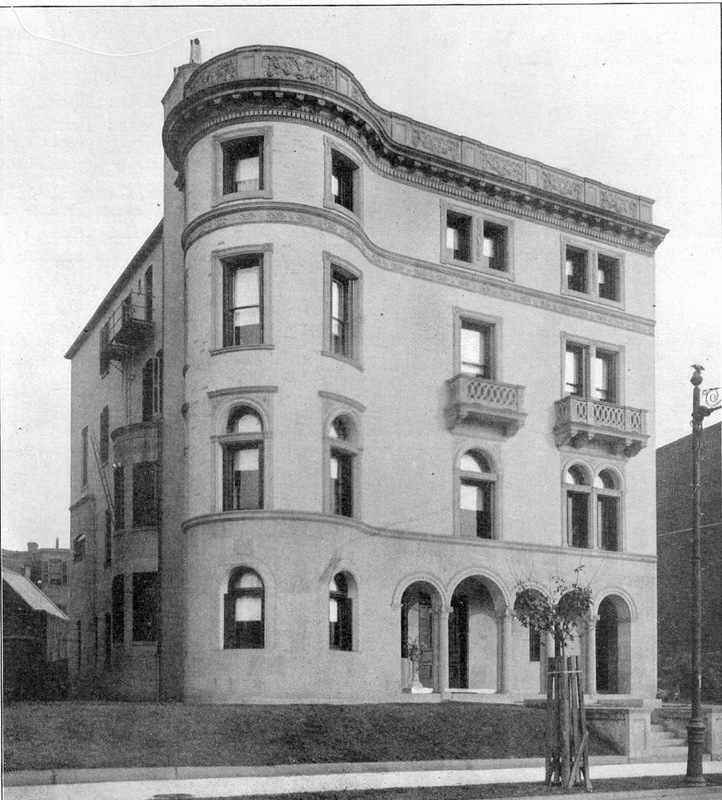 One example of this transformation exists at 1611-17 Connecticut Avenue, the home to the Anne Taylor Loft store (below), which was built as a private mansion by a wealthy widow from California. Its house history includes a story of lavish living, an early death, and a lawsuit brought against the estate by a seven year old heir that thought she had been slighted in Colton’s last Will and Testament. hair that went well with his bold and expressive temperament. David Colton (below) had been born in Maine on July 17, 1831, and migrated with his family to Illinois, where he married Ellen Mason White during his freshman year at Knox Manual Labor College. In the spring of 1850, the Colton’s and a friend named Hiram G. Ferris dropped out of college and joined the gold rush to California, where they eventually settled into Shasta City and Colton was elected as their sheriff at the young age of 20. They had two children; Helen in 1854, and Carrie in 1856, who would die shortly after she was married. David Colton purchased a local paper, and would often be referred to as General D. D. Colton, a title he acquired when he was commissioned a Brigadier General in the Siskiyou Co. branch of the California State Militia. Like many in the West, he was involved in three near duels; the first stemming from rivalry between local Democrats and Whigs, and a second with his opponent for a failed state Senate run in 1857. He obtained a law degree, and opened a practice in law and mine stock trading in San Francisco that became fabulously successful. He was President and major owner of the Amador gold mine, which yielded half-million dollars annually and his San Francisco properties brought in rents totaling $3,000 monthly. 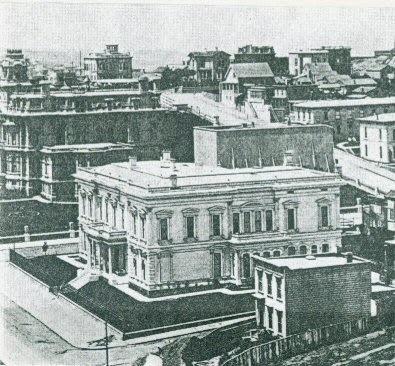 In 1872 Colton built a stately mansion on San Francisco's Nob Hill (below). Located on the NW corner of California and Taylor Streets it was built on a half city block at a cost of $75,000. The interior was decorated with works of art and antique furniture acquired during their two year travels and contained a large library stocked with works of English literature. 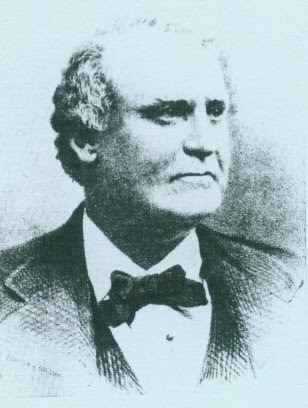 David Colton rose to his greatest prominence in 1874 when he became associated with the directors and principal stockholders of the Central Pacific R.R. that built the western most section of the nation’s first transcontinental railroad. At age 47, Colton died rather suddenly from injuries that he received from falling off a horse. His estate and business affairs were left to his widow, Ellen Colton. A lawsuit for fraud was filed, a civil suit would follow and then many countersuits; it would take 12 years for these legal battles to end, and she had spent over $100,000 in legal fees only to see $4 million of the estate lost trying to clear her deceased husband's name. 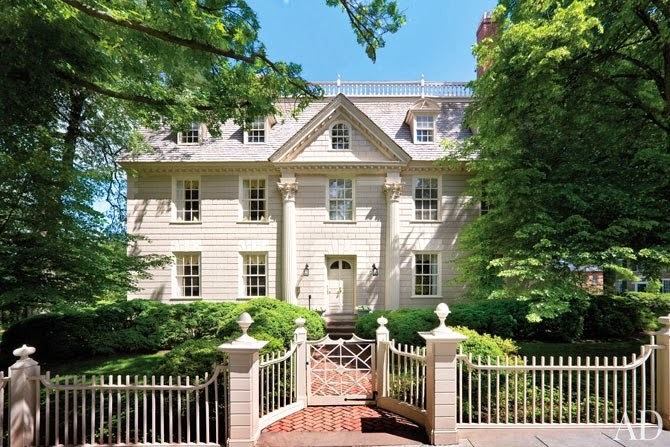 Following the death of her husband and being excluded from much of San Francisco society, Ellen Colton sold the mansion and relocated to Washington, DC, where she built 1617 Connecticut Avenue in 1895. 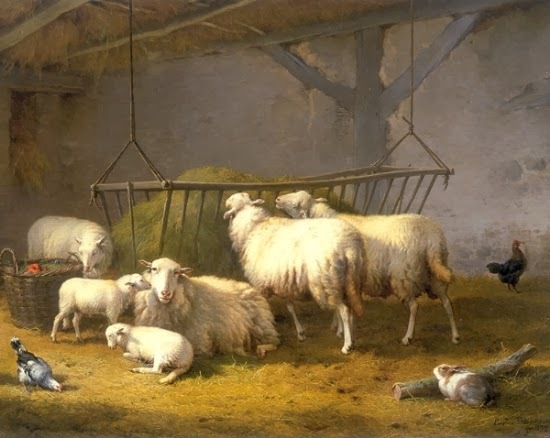 She filled the house with art and antiques that would eventually be appraised at nearly $64,000, including “The Sheep” painting by Verboeckhoven valued at $10,000 alone (below), and a library with 1,000 rare books. Ellen Colton died in February of 1905, leaving an estate valued at over $1 million dollars, all but $1,000 of which was left to her surviving daughter, Caroline Martin Dahlgren, and her two children. 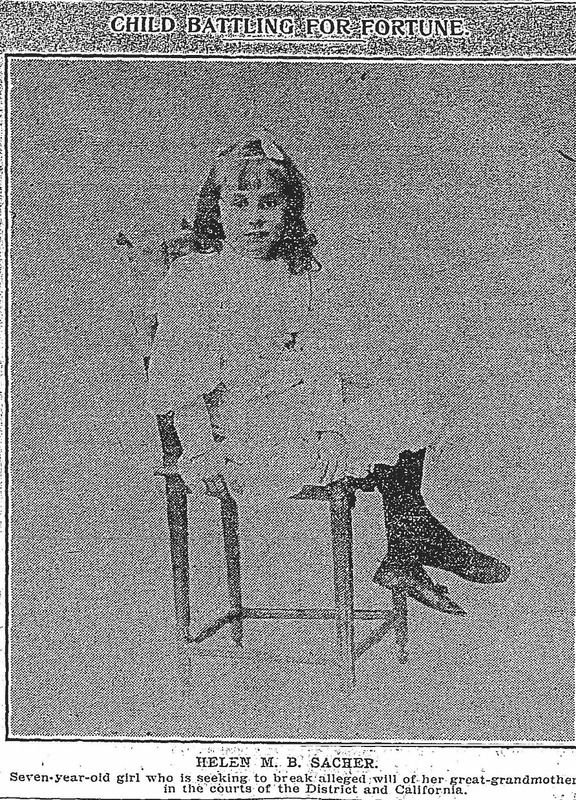 Her granddaughter from her deceased daughter Helen, Miss Helen Margaret Beatrice Sacher, was just six years old at the time, and like any child, should have been thrilled with inheriting $1,000 at such a young age. She, however, accused her older cousins of coercing their senile grandmother while she was away living in Paris into leaving the entire estate to that side of the family. She also accused them of stealing silverware and other valuables from the home while Mrs. Colton was still alive, forging her signature on the Will, and stealing $350,000 worth of transferable bonds. Sacher was the daughter of a wealthy Parisian banker named Seigfried Sacher. A lawsuit was initiated by Helen the following year that was covered thoroughly in the social columns that dragged on for years, until 1908, when Helen turned nine years old. 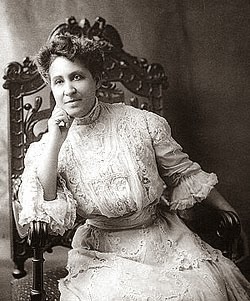 The case headed to trial, but a settlement was struck due to the social hype that surrounded the jury trial, and young Helen received $250,000 from the estate. The house went up for public auction in December of 1908, but failed to sell when the winning bid came at $85,000, under estimates. 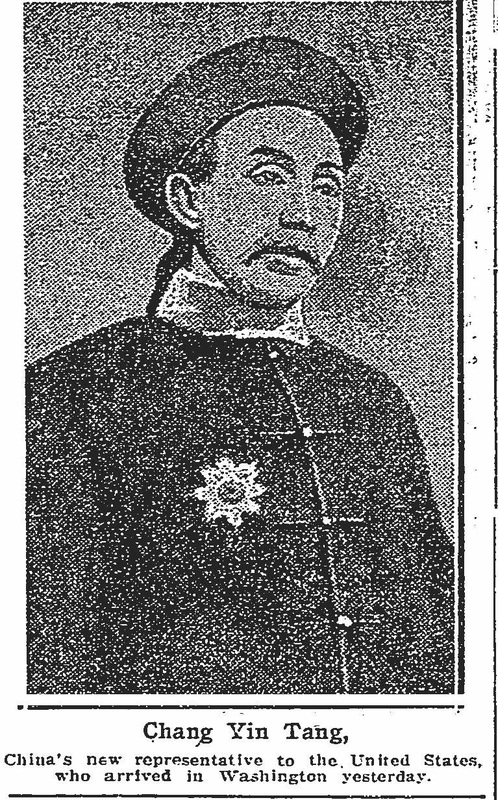 The mansion was eventually sold in December of 1909 to the Chinese government as the residence for a new Chinese Minister to the United States, Chang Yin Tang (below). Newspaper reports that he arrived with 50 attaches, secretaries, servants, and students along with two large moving vans of household furniture. By 1908, another mansion had been built adjoining the house to the south, and in 1923, the Colton Mansion’s ground floor was converted into a retail space, with large glass windows replacing the columned entranceway. The first retailer was The Coat Shop, operated by Barner Harrison. Incidentally, in November of 1932, he had his front window broken by somebody who got away with a Prussian broadtail coat with silver fox collar and cuffs valued at $1,000. The Lincoln Congregational Temple United Church of Christ, built beginning in 1928 on the northeast corner of 11th and R Streets, NW is an unusual example of Italian Romanesque Revival architecture. It was designed by Howard W. Cutler, and replaced a mission that had been built in the site in 1868. It is regarded as the oldest African- American Congregational Church in Washington, DC. 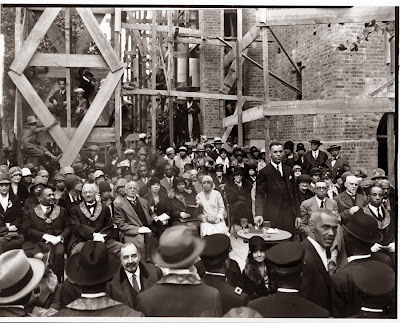 The opening ceremony in 1928 is is illustrated below. Lincoln Temple evolved from religious organizations founded at Civil War camps close by, including Camp Barker at 13th and R Streets, the founding of a Sabbath school in 1863 at the Wisewell Barracks at 7th and P Streets, and establishment of the Lincoln Mission as a school and community center at the corner of Ninth and R Streets, NW. Following the War, thousands of freemen stayed in what was then the edge of the city, benefiting from food, clothing, and religious education, provided by a number of benevolent organizations and church groups. 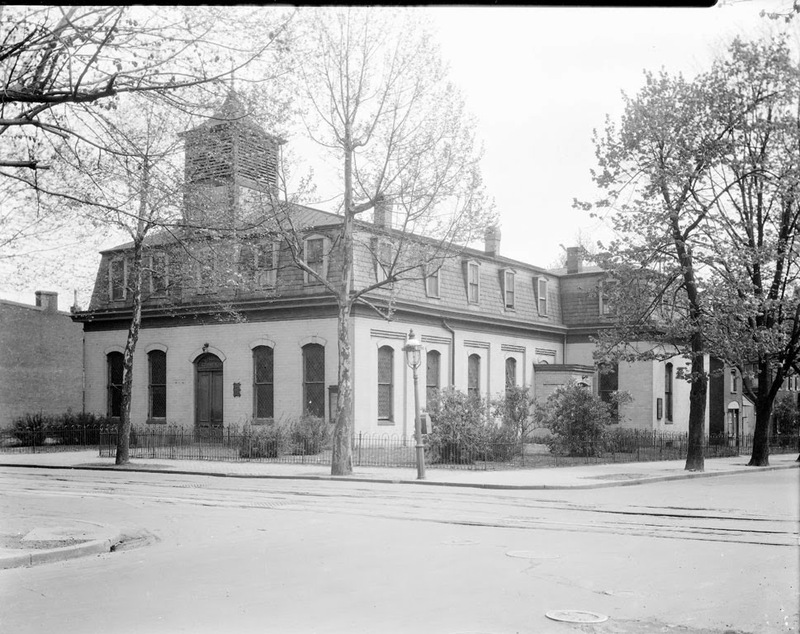 In 1868, the Colfax Industrial Mission seen here was built at the corner of 11th and R Streets by the American Missionary Association "for the education of the colored children of Washington." It was formally dedicated in 1870 and celebrated its first Sunday service the leadership of Rev. G. N. Marden. The Colefax mission was renamed the Lincoln Industrial Mission in 1870, in memoriam to fallen President Abraham Lincoln. Ten years later, in 1880, ten black members of the First Congregational join with mission and chartered the Lincoln Memorial Congregational Church. Rev. Simon Peter Smith served as its pastor. Later in 1901, it merged with the Park Temple Congregational Church, with Rev. 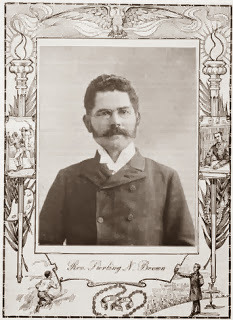 Sterling Brown (father of poet Sterling Brown 1901-1989), Pastor of Park Temple, serving as its pastor. Born in Tennessee, Rev. Brown was educated at Fisk University and the Oberlin Theological Seminary. 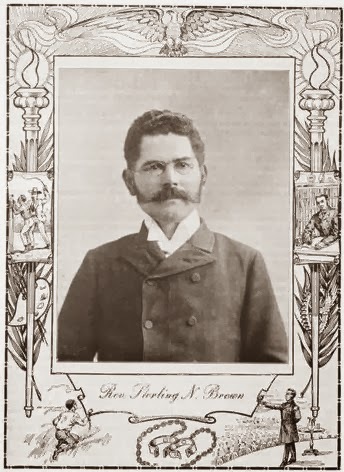 At Lincoln Temple, Brown introduced a business school and an employment agency, and made the building a central meeting place for such organizations as the Bethel Literary and Historical Society and the Samuel Coleridge – Taylor Choral Society. Dr. Brown taught in the Howard University Theological Department from 1892 until 1914, and in 1924, wrote a biography named My Life Story. In November of 1903, the congregation was one of several churches in Washington to host the national Conference on the Race Problem in the United States, which resulted in the schlolarly proceedings titled How to Solve the Race Problem. The congregation obtained a permit to build the current structure at 11th and R Street on June 9, 1928, with construction overseen by Rev. Robert Brooks. It was designed by architect Howard Wright Cutler (1883-1948), who was born on February 19, 1883 in Ouray, Colorado to geologist Martin Van Buren and Margaret (Jocknick) Cutler. He was educated at the local schools, and obtained a B.A. in architecture from the Athenaeum and Mechanics Art Institute in Rochester, New York in 1904. He began his architectural career at the local firm coined Gordon and Maden. He began his own architectural firm in 1906, designing building for the Eastman Kodak Company in Rochester, NY. In World War One, he was assigned to the Designing and Architectural Department, and rose to the rank of Major. He designed hospitals across the country, including an addition to the Walter Reed Hospital in Washington, DC. Following the War, Cutler formed a firm in Washington, DC with the name of Cutler and Woodbridge with engineer Samuel Woodbridge from 1919-1921, and then Cutler and Moss with architect Louis R. Moss, which lasted until 1923. He practiced on his own after that time, and resided in Silver Spring, Maryland. Cutler designed more than 25 schools in Montgomery County, Maryland. Two years prior to his work on Lincoln Temple, in 1926 he designed the Spanish-Mission Revival Eldebrooke Church at 4100 River Road in Tenleytown. Perhaps its most notable congregant was Mary Church Terrell (left), who in 1952 led lead lunch counter sit-ins in downtown Washington. In 1963, the Lincoln Temple served food to participants in the March on Washington, and six years later, its auditorium served as the venue for a concert by musician and vocalist Roberta Flack. Lincoln Temple members have always been proud of their history, and in 1994, they led the effort to list the building in the District of Columbia Inventory of Historic Sites in 1994; it was listed in the National Register of Historic Places a year later.